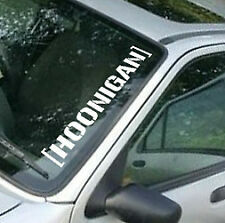 [HOONIGAN] Bumper Sticker. The sticker has no background and is applied directly to exterior surfaces to produce a professional finish. There are 32 colours from. This is for one sticker inWHITE, other colours available. EXTERNAL Sticker. Available in RED. We are specialists in vehicle foils, trims, decals and stickers. We're committed to bringing you the highest quality products. We have 8 years of online trade experience. 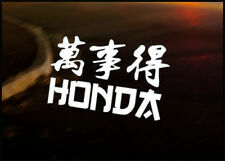 1x "Kanji Honda" Decal in white. Each decal is fitted with application tape and by following the instructions anybody can obtain a professional finish. They can be applied to any body part, screen or glass etc. 1x Sticker. High resolution quality print computer generated graphic decals, made of first quality Waterproof vinyl and UV-resistant colours. Size 150mm x 31mm. ALPINESTARS LOGO. The sticker has is single colour and has no background it is applied directly to exterior surfaces to produce a professional finish. There are 32 colours from. This gives better and longer lasting results. 2x VW 'WOLFSBURG EDITION' car stickers decals - 24 colours! - great present! 2x VW Wolfsburg Edition Stickers. Available in a multitude of colours. Sold in pairs for each side of your car - choose two colours if you wish! Our VW stickers are made from the finest marine grade vinyl to suit most rugged applications. Stop Parking Like An IDIOT Sticker Decal Novelty Gift Gag Bumper Sticker. We all know how it is. 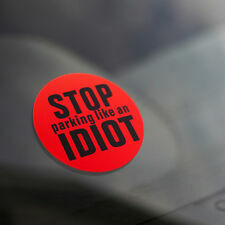 Give the driver a helpful bit of advice with our large "Stop Parking Like An IDIOT" Stickers! Large, easy-peel stickers, for use on all bad parking! 1 sticker,8.5cm X 10cm (approx.3.3" X 4"). We will reply to you asap. More details against scratches, chemicals, oil, sun rays, rain etc. 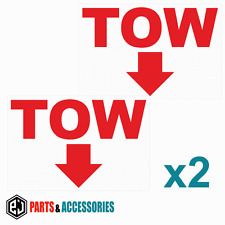 Cut Vinyl Decal Sticker -TOW OPPOSITE PAIR. CUT VINYL STICKERS - NOT PRINTED STICKERS. Our Self Adhesive vinyl stickers have no backing colour. The colour behind the design is the surface. MADE FROM 5-7 YEAR EXTERNAL GRADE VINYL. BMW M performance 3D Boot Sticker for 1 2 3 4 5 6 7 X1 series. Material:Carbon fiber. • There may a slight deviation in colour of actual product due to lighting affect when taking photographs. Sline Bumper Sticker. 3D Carbon fiber. • There may a slight deviation in colour of actual product due to lighting affect when taking photographs. Further Information. High resolution quality print computer generated graphic decals, made of first quality Waterproof vinyl and UV-resistant colours. 1x Sticker ! Description: 1 pieces of red colour metal alloy Ford ST style logo badge bumper grille emblem Size: ~2.94" x 1.2" x 0.24" (~7.35 x 3 x 0.61 cm) Colour: Red on the front body w/ Silver Chrome on the frame 100% brand new Waterproof & durable, UV resistant Screws & Bolts Included Easy to fit Universal fit for Ford grill / grille like Focus, Fiesta, Kuga, Mondeo etc Package included: 1x Metal ST logo bumper grill badge emblem red for Ford . Tiger Shark Teeth Stickers. This is a gloss vinyl printed sticker. Size Width 178 x Height 60mm (approx.). each sticker. Easy to apply made with high quality gloss outdoor Vinyl. We have been producing vinyl stickers since 2003. FUNNY STICKERS. Dirty Diesel vinyl sticker. There are 32 colours from. This is for 1GLOSS WHITE sticker, other colours and sizes available. Easy to apply made with high quality gloss outdoor Vinyl. The sticker has no background and is applied directly to exterior surfaces to produce a professional finish. OH NO FACE TOO LOUD EXHAUST FUNNY CAR STICKER. FUNNY STICKERS. Easy to apply made with high quality gloss outdoor Vinyl. There are 32 colours from. The sticker has no background and is applied directly to exterior surfaces to produce a professional finish. 7" wide in white. 7" MG X POWER LOGO PAIR. Colour can be changed on almost every design. On door boards especially Custom logos and text can be added to make the design totally personal to you e.g club logos. Step 3: Rub over with a cloth to smooth. Step 1: Peel the transfer film off the backing paper. Step 2: Apply the transfer film onto desirable object. Ideal for dry, clean, and smooth surfaces. Digital Laminated print ! Size: 10cm x 4cm. Once applied it look like the graphic is actually painted on. Ideal for dry, clean, and smooth surfaces. Can be stuck onto most smooth surfaces including walls, doors, windows, mirrors, refrigerators, cars, ect. 'Manchester Bee ' Bumper Sticker (YELLOW) - HIGH QUALITY VINYL DECAL. We use the latest technology to cut out our vinyls to create a long lasting and high quality finish. This sticker is the perfect gift for anyone who wants to customize their vehicle. 1x "Built not bought" Decal in white. Each decal is fitted with application tape and by following the instructions anybody can obtain a professional finish. They can be applied to any body part, screen or glass etc. [HOONIGAN]. Bumper Sticker Easy to apply made with 3 to 5 year outdoor Vinyl. The sticker has no background and is applied directly to exterior surfaces to produce a professional finish. There are 32 colours from. Don`t keep your decal unused more than 1 week! Otherwise its start to be unstick and it will be hard to apply! The sticker will have no colour background and for exterior fitting. if you will not add specifics in order details or write a letter we will dispatch –. BABY SURFER ON BOARD Decal! Turn decal over and stick to hard surface of your choice (ie. coffee cup, wall, car bumper - just about anywhere!). - stick down centre first by gently bending decal at the centre, then stick down outer edges. Description: 1 pieces of blue colour metal alloy Ford ST style logo badge bumper grille emblem Size: ~2.94" x 1.2" x 0.24" (~7.35 x 3 x 0.61 cm) Colour: Blue on the front body w/ Silver Chrome on the frame 100% brand new Waterproof & durable, UV resistant Screws & Bolts Included Easy to fit Universal fit for Ford grill / grille like Focus, Fiesta, Kuga, Mondeo etc Package included: 1x Metal ST logo bumper grill badge emblem blue for Ford . Stance vinyl sticker. 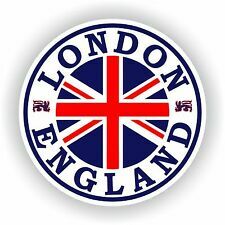 This is for 1GLOSS BLACK sticker, other colours and sizes available. The sticker has no background and is applied directly to exterior surfaces to produce a professional finish. Monster Claw Vinyl Sticker. This is a gloss vinyl printed sticker, fitted with application tape to make fitting easier. Size Width 150 x Height 145mm (approx.). each sticker. Easy to apply made with high quality gloss outdoor Vinyl. BABY SKATER ON BOARD Decal! Turn decal over and stick to hard surface of your choice (ie. coffee cup, wall, car bumper - just about anywhere!). - stick down centre first by gently bending decal at the centre, then stick down outer edges. 1x "Rust" Decal in white. 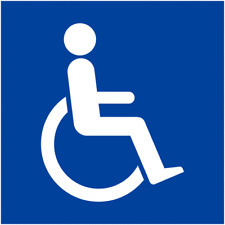 Each decal is fitted with application tape and by following the instructions anybody can obtain a professional finish. They can be applied to any body part, screen or glass etc. Decal in white. Each decal is fitted with application tape and by following the instructions anybody can obtain a professional finish. They can be applied to any body part, screen or glass etc. We use the latest technology to cut out our vinyls to create a long lasting and high quality finish. These stickers are the perfect gift for anyone who wants to customize their vehicle. Here at Vinyl Graphics we use the highest quality Avery Dennison PVC vinyls ensuring long lasting and effective graphics. 'Diamond' Bumper Sticker (White) - HIGH QUALITY VINYL DECAL. We use the latest technology to cut out our vinyls to create a long lasting and high quality finish. This sticker is the perfect gift for anyone who wants to customize their vehicle. 1x "Kanji - Mitsubishi" Decal in white. Each decal is fitted with application tape and by following the instructions anybody can obtain a professional finish. They can be applied to any body part, screen or glass etc. 1x "Enzo Ferrari Signature " Decal in white. Each decal is fitted with application tape and by following the instructions anybody can obtain a professional finish. They can be applied to any body part, screen or glass etc. Waterproof UV resistant. Baby On Board. High quality White gloss vinyl is used in production of the sticker. 1x "Unemployed Stig - Will drive for food.". Decal in white. Each decal is fitted with application tape and by following the instructions anybody can obtain a professional finish. They can be applied to any body part, screen or glass etc. FUNNY STICKERS. This is for a GLOSS RED sticker, other colours and sizes available. Applying them is an easy and straightforward process. All stickers are weather & water proof, using non-fade colours to provide a lasting effect. BABY ON BOARD - Mickey Mouse Decal! Turn decal over and stick to hard surface of your choice (ie. coffee cup, wall, car bumper - just about anywhere!). - stick down centre first by gently bending decal at the centre, then stick down outer edges. 1x "KANJI - Made in Japan" Decal in white. Each decal is fitted with application tape and by following the instructions anybody can obtain a professional finish. They can be applied to any body part, screen or glass etc. 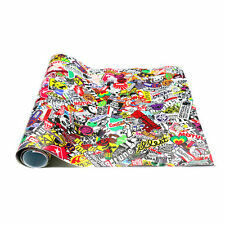 Size: 60"X20"/152x50cm. Strong self adhesive & slide and re-position without any trail. Material: Vinyl. With air bubble release channels. Repairs will be processed through the manufacturer, we will assist in the repair procedure in any way we can to expedite the process. Easily applied to the rear of your car, van, lorry, caravan or trailer - instructions included. Decal is cut in one colour vinyl, and. Sticker is cutted and ready to apply on any nonporous and degreased surface. IT'S NOT PRINTED STICKER! IT'S PLOTTER CUTTED IN PROFESSIONAL OUTDOOR VINYL. Stick it on by transfer foil ( decals are ready to stick on). 4 x Barbed Wire Sticker in 5-7 yr black vinyl. Vinyl decals are where each individual component. Colour of surface adhered to will show as the white parts. Overlaid with a application tape for easy application. 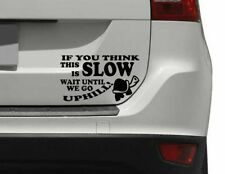 If you think this is SLOW, wait until we go uphill! FUNNY STICKERS. Funny Car/Van/Truck/Bumper/Window Vinyl Decal Sticker. There are 32 colours from. If you like this item have a look at our colour version.